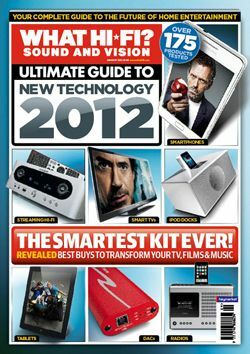 The Ultimate Guide to New Technology 2012, on sale now | What Hi-Fi? On sale from today, November 18th, The Ultimate Guide to New Technology 2012 features an amazing 175 reviews, covering every aspect of digital media technology. We've tested everything from the latest portables, such as the new iPhone 4S and Sony Tablet S, through to state-of-the-art media streamers including Sony's £99 SMP-N200, network AV amps and DACs (digital-to-analogue converters). The guide brings you up to speed with the latest developments in Smart TV, 3D technology and 4K video, and even lift the lid on Sony’s radical new Personal 3D Viewer. at the world’s No.1 home entertainment brand, What Hi-Fi? Sound and Vision. What's more, we've got an exclusive interview with Roger Mosey, the BBC's director of London 2012, discussing the Beeb's plans for Super Hi-Vision coverage of the games (that's 16x the resolution of normal high-definition). So look out for the feature-packed Ultimate Guide to New Technology 2012 in your local newsagent, or download the digital edition from Zinio, from November 18th.